Pro Football Focus’ 2019 QB Annual is LIVE! Quarterback is one position where there is an overabundance of statistics, not to mention wins and losses, to quantify how a passer is playing. But statistics are results-based numbers and often owe as much or more to players other than the quarterback. That influence from other players can warp or distort the perception of the quarterback’s play, effectively giving him credit or punishing him for things he had nothing to do with. The basic tenet of Pro Football Focus’ grading has always been to try and isolate the play of individuals from the rest of the team, giving you a true reflection of what they did, regardless of whether that was rewarded by teammates picking up the baton. A product of PFF’s advanced grading system, ball location charting, situational charting and ranging advanced statistics, the 2019 QB Annual is now available to all EDGE and ELITE subscribers. 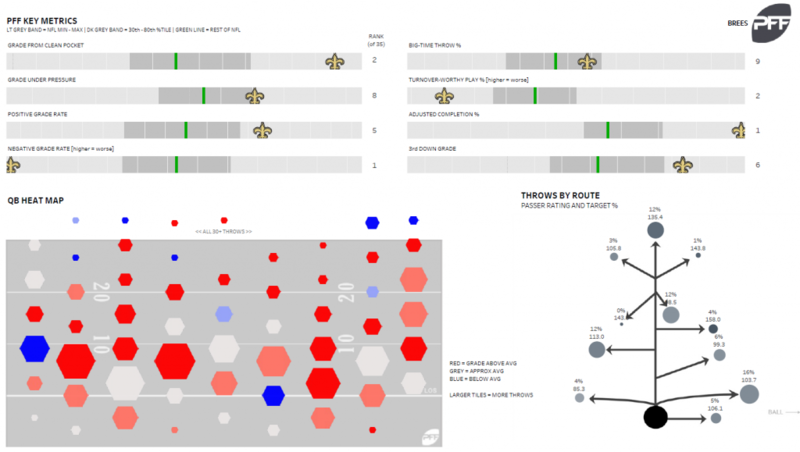 If you are a regular reader of PFF, you know we analyze quarterbacks in incredible detail. 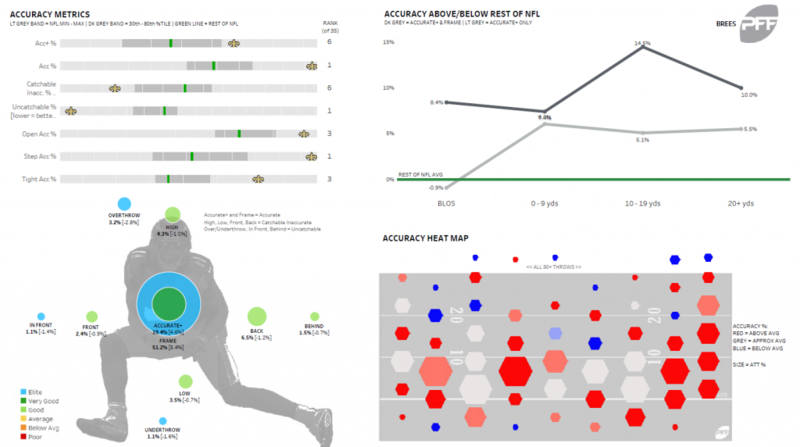 Our exclusive database of performance metrics gives us unique insights into the factors that determine a quarterback’s success in the NFL. With the launch of our 2019 QB Annual, you now have access to the same level of detail our professional analysts use throughout the year. PFF EDGE and ELITE subscribers can download here. This year’s annual features 35 quarterbacks who played meaningful roles in their team’s on-field performance during the 2018-2019 season. Each profile features a nine-page spread that includes PFF data points you won’t find anywhere else. Featured grades and key metrics within the 2019 QB Annual include: Big-time throws, turnover-worthy plays, advanced ball location data, PFF situational (i.e. red zone, third down, pressure, no pressure) grades and much more. Our unparalleled accuracy metrics show what throws your favorite QB excelled with and compares those results with the NFL league average. PFF’s team of senior analysts, including former Oklahoma State and NFL quarterback Zac Robinson, all contributed to the 2019 QB Annual. In addition to the complex data, charts and numbers, Robinson offers context on each of the 35 quarterbacks in written blurbs. Sign up for PFF EDGE today to access your copy. PFF EDGE subscriptions are available for $39.99 per year, or $9.99 per month. Your EDGE subscription gives you access to some of our most popular features, including the 2019 NFL Draft Guide, which debuts in March after the NFL combine.